This is a nice collector Item, everything was well produced and looks nice but from a music listener point of view I'm disapointed. If you are into the music and not into collecting stuff, buy another pressing as this is pressed very bad. 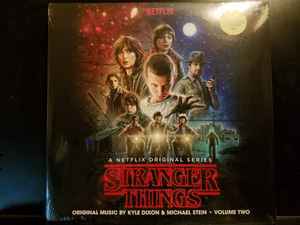 On my record one the first two tracks ("Stranger Things" / "Kids") are ruined by very loud clicks throughout the whole songs. Anyone else bought this set and could comment on the sound quality? I bought the aquamarine splatter volume one and the clear frosted volume 2 (2 copies) from Invada and they were terrible pressings to the point where I am amazed at some of the reviews left for these versions on Discogs saying how good they are. They were noisy, clicky, covered in non-fill and scratches. I would love to buy this set but if the sound quality is awful then what's the point? I'm all up for coloured pressings but if the plant can't get it right just do them on black vinyl I say! My copy had terrible clicks and pops and surface noise on most tracks, so I had to return it. I've played my copy several times now, both on moderate and (very) high volume and I don't hear anything of the aforementioned clicks, pops or clipping, guess I got lucky? Can anyone comment on the sound of this record. I know the sound of a few glow in the dark records have suffered at the fate of their novelty. Thanks in advance.